The Ninja Foodi multi-cooker is the ultimate cooking tool these days. Millions of people all over the world rely on this special kitchen tool that has successfully replaced so many complex products.The Ninja Foodi allows you to air fry, pressure cook, dehydrate, bake and roast at the same time.It helps you make so many amazing, rich and textured dishes in a matter of minutes.You don’t need to be an expert in the kitchen and you don’t need any special skills to make delightful meals using the Ninja Foodi. All you need is the right ingredients and this wonderful cooking journal that will help you understand how the Ninja Foodi really works.Discover amazingly simple ninja foodi recipes such as:BreakfastsSoups and StewsSaladsSides and SnacksPoultry and Meat recipeVegetarian recipesSeafood and FishDessertsSo, what are you waiting for? 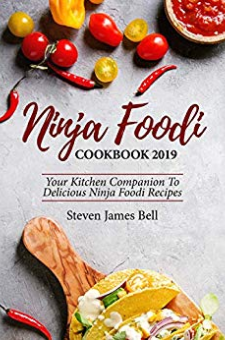 Grab this copy and get a Ninja Foodi cooker and start cooking some pretty awesome feasts.You will love your Ninja Foodi and you will definitely appreciate the flavored meals you can make with this machine.